Perspective of the plan for Calbayog Coastal Diversion. CALBAYOG CITY – A Coastal Diversion Road is slated to be constructed by the DPWH Samar First at the earliest possible time this year. The idea is conceived out an immediate need to provide an alternate route to decongest traffic in Calbayog City proper. The increasing volume of vehicles, mostly heavily loaded trucks plying along the National Road from Luzon to various destinations in the south including local motorists, congest the National Road in the City Proper of Calbayog. Seen as a long-term solution to decongest traffic like the Calbayog Diversion Road, the Coastal Diversion Road is going to be implemented together with the idea of bringing economic development in the area. These two roads will serve as significant components of the road network in Calbayog City but with the latter being more accessible. The road projects are divided in three points: the first where it starts in Brgy. San Policarpo, Calbayog City; the second that acts as a midpoint access in Brgy. Aguit-Itan; and the last one in Brgy. Rawis where it ends. The total length of the road is 4.6732 km. with 4 lanes. The diversion road covers bank and slope protection works and other structures. For FY 2018, the District has programmed for these road sections the total amount of P350 million. 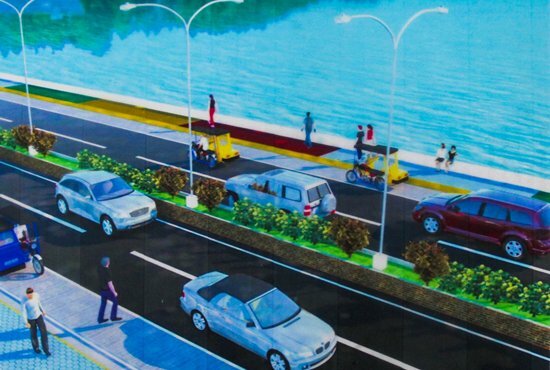 This project aims to minimize traffic congestion in the city proper by diverting the vehicular traffic to the Coastal Diversion Road thereby, reducing traffic accidents or convergence in the busy city streets. Since the passage in the diversion road decongests traffic in Calbayog City’s major thoroughfare, travel time will also be reduced. Inevitably, this will soon also spur economic activities in barangays traversed by the road projects.